BOSTON, MA, February 02, 2018 -- Castle Connolly Medical Ltd., America's trusted source for identifying Top Doctors, has selected Boston's Neurology specialist Dr. Drasko Simovic for inclusion in its highly selective list of Castle Connolly Top Doctors this year. Castle Connolly Medical Ltd. publishes its list of Castle Connolly Top Doctors at www.castleconnolly.com, as well as in a wide variety of printed directories, partner publications and on partner/affiliate websites. All told, more than 44,000 physicians - approximately 5% of the nation's licensed physicians - have been selected as Castle Connolly Top Doctors in their regions for their specialties. Drasko Simovic, M.D., Assistant Professor of Neurology at Tufts University is a graduate of the Boston University Residency Program in Neurology. He completed two sub-specialty fellowships at St. Elizabeth's Medical Center, Tufts University, in Boston, MA. He is Board Certified in Neurology, Electrodiagnostic Medicine, Clinical Neurophysiology and Disability Analysis. He is the Medical Director of EMG Laboratory, an AANEM Accredited Laboratory with Exemplary Status. His clinical and research achievements have been featured in national and international scientific and popular media. 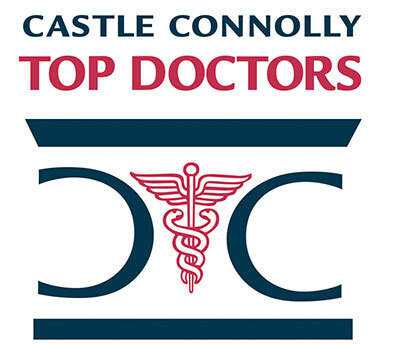 For more information on this Castle Connolly Top Doctor, please visit Drasko Simovic's profile on www.castleconnolly.com. Castle Connolly Medical Ltd.'s President and CEO Dr. John Connolly has this to say about Dr. Simovic's recognition: "Only a small percent of physicians are selected to be Castle Connolly Top Doctors. Our goal is to make it easier for an average person to find the right doctor for them in what can be an overwhelming process at a difficult time in a person's life. Dr. Simovic was nominated by physician peers and selected by our physician-led research team at Castle Connolly Medical Ltd. Selection is an impressive accomplishment worthy of recognition. My congratulations to Dr. Simovic." To find out more or to contact Dr. Drasko Simovic of Boston, MA, please call 978-687-2586, or visit www.emglaboratory.com. This press release was written by American Registry, LLC and Castle Connolly Medical Ltd., with approval by and/or contributions from Drasko Simovic. American Registry, LLC, recognizes excellence in top businesses and professionals. For more information, search The Registry at www.americanregistry.com. Castle Connolly Medical Ltd. is a healthcare research and information company founded in 1991 by a former medical college board chairman and president to help guide consumers to America’s top doctors and top hospitals. Castle Connolly’s established nomination survey, research, screening, and selection process, under the direction of an MD, involves many hundreds of thousands of physicians as well as academic medical centers, specialty hospitals, and regional and community hospitals all across the nation. Castle Connolly’s physician-led team of researchers follows a rigorous screening process to select top doctors on both the national and regional levels. Its online nominations process—located at castleconnolly.com/nominations—is open to all licensed physicians in America who are able to nominate physicians in any medical specialty and in any part of the country, as well as indicate whether the nominated physicians is, in their opinion, among the best in their region in their medical specialty or among the best in the nation in their medical specialty. Careful screening of doctors’ educational and professional experience is essential before final selection is made among those physicians most highly regarded by their peers. The result: Castle Connolly identifies the top doctors in America and provides the consumer with detailed information about their education, training, and special expertise in its paperback guides, national and regional magazine “Top Doctors” features, and online directories. Castle Connolly Medical Ltd. America's trusted source for identifying Top Doctors has published its newest edition of Regionals Top Doctors and has selected Drasko Simovic , MD for this exclusive honor. Dr. Drasko Simovic, a Boston, MA physician who is Board Certified in Neurology, has been selected by Castle Connolly Medical Ltd. for inclusion in its prestigious guide of the nation's top 1% of medical specialists, Regional Top Doctors. BOSTON, MA, February 17, 2017-- Castle Connolly Medical Ltd. America's trusted source for identifying Top Doctors has published its newest edition of Regionals Top Doctors and has selected Drasko Simovic , MD for this exclusive honor. Castle Connolly Top Doctors who are selected each year by Castle Connolly Medical Ltd. are first nominated by their peers in an online nomination process. Nominations are open to all board certified MDs and DOs and each year tens of thousands of physicians cast many tens of thousands of nominations. Nominated physicians are then screened and selected by the Castle Connolly physician-led research team based on criteria including medical education, training, hospital appointments, disciplinary histories and much more. Only physicians such as Drasko Simovic who are considered to be among the top 1% in their specialties are selected for inclusion in the Regional Top Doctors. About Drasko Simovic: Drasko Simovic, M.D., Assistant Professor of Neurology at Tufts University is a graduate of the Boston University Residency Program in Neurology. He completed two sub-specialty fellowships at St. Elizabeth's Medical Center, Tufts University, in Boston, MA. He is Board Certified in Neurology, Electrodiagnostic Medicine, Clinical Neurophysiology and Disability Analysis. He is the Medical Director of EMG Laboratory, an AANEM Accredited Laboratory with Exemplary Status. His clinical and research achievements have been featured in national and international scientific and popular media. For more information on this Castle Connolly Top Doctor , please visit Drasko Simovic 's profile on www.castleconnolly.com. Castle Connolly Medical Ltd.'s President and CEO Dr. John Connolly commented on Dr. Simovic's recognition: "Being selected for inclusion in the Regional Top Doctors is a very significant achievement given to only 1% of American physicians. The world of American doctors includes incredibly high quality medical professionals, yet some stand out. Each year we evaluate tens of thousands of peer nominations from throughout the medical community. Then our experts go even deeper to evaluate and select Top Doctors based on referred doctors' exceptional work and outstanding conduct. My congratulations to Dr. Simovic." To find out more or to contact Dr. Drasko Simovic of Boston, Lawrence & Hyannis, MA, please call 978-687-2586, or visit www.emglaboratory.com. Castle Connolly Medical Ltd. identifies top doctors in America and provides consumers with detailed information about their education, training and special expertise in printed guides and online directories. It is important to note that doctors do not and cannot pay to be included in any Castle Connolly guide or online directory. Learn more at www.emglaboratory.com. Lawrence and Hyannis, MA, November 11, 2015 - Dr. DraskoSimovic, Medical Director of AANEM Accredited EMG Laboratory with Exemplary Status in Lawrence and Hyannis MA, has joined the Expert Network as a Distinguished Doctor™, a distinction based on peer reviews and ratings, numerous recognitions, and accomplishments achieved throughout his career. Dr. Simovic has been serving Merrimack Valley, Cape Cod and surrounding communities with a specialized focus on clinical neurophysiology and electrodiagnostic medicine for over 20 years. Dr. Simovic was selected to join the Expert Network and be recognized among the top medical professionals in his field due to his extensive educational background, awards, and career longevity. Dr. Simovic graduated from the Boston University Affiliated Residency Program in Neurology and completed two fellowships at St. Elizabeth’s Medical Center, Tufts University in Boston, MA. Currently, Dr. Simovic is Assistant Professor of Neurology at Tufts University, School of Medicine. He is Board Certified in Neurology, Electrodiagnostic Medicine, Clinical Neurophysiology, and Disability Analysis. “It is rewarding to earn the trust and confidence of our colleagues and to provide referring physicians with the highest level of Electrodiagnostic Medicine. A thorough and properly conducted EMG test is a key diagnostic step as physicians select the best course of treatment for their patients. We are grateful physicians choose us to be part of that important process and are committed to continuing to provide excellent service to the medical community." The Expert Network has written this news release with approval and/or contributions from Dr.DraskoSimovic. The Expert Network is an invitation-only reputation management service that is dedicated to helping professionals stand out, network, and gain a competitive edge. The Expert Network selects a limited number of professionals based on their individual recognitions and history of personal excellence. Castle Connolly Medical Ltd., America's trusted source for identifying Top Doctors, has selected Dr. Drasko Simovic for inclusion in its highly selective 2014 Top Doctors list. LAWRENCE and HYANNIS, Mass., June 30, 2014 /PRNewswire-iReach/ -- Castle Connolly Medical Ltd., America's trusted source for identifying Top Doctors, has selected Dr. Drasko Simovic for inclusion in its highly selective 2014 Top Doctors list. Castle Connolly Medical Ltd. is a highly regarded healthcare research and information company that identifies top doctors in America and provides consumers with detailed information about physicians. The Top Doctor list is based on an extensive nominating process in which doctors who excel in their specialties are selected by their peers. Their credentials and qualifications are then carefully reviewed and evaluated by a physician-led research team and key personnel who select the honorees. Doctors cannot pay to be included on a Castle Connolly Top Doctors® list and they cannot nominate themselves. In addition to peer nominations, a physician-led research team makes thousands of phone calls each year to leading specialists, chairs of clinical departments and others involved in healthcare, gathering further information regarding the top specialists for various diseases and procedures. All told, fewer than 36,000 physicians - less than 5% of the nation's licensed physicians - have been selected as Castle Connolly Top Doctors in their regions for their specialties. "It is such an honor to receive this recognition from my peers as our mission as always been to earn the trust and confidence of our colleagues and to provide referring physicians with the highest level of Electrodiagnostic Medicine," says Dr. Simovic. "A thorough and properly conducted EMG test is a key diagnostic step as physicians select the best course of treatment for their patients. We are grateful physicians choose us to be part of that important process and are committed to continuing to provide excellent service to the medical community." EMG Laboratory, led by Dr Simovic, was awarded the American Association of Neuromuscular & Electrodiagnostic Medicine's (AANEM) highest level of recognition, Accreditation with Exemplary Status. Electrodiagnostic Medicine helps diagnose conditions with symptoms including pain, numbness, tingling and/or weakness from problems such as carpal tunnel syndrome, neuropathy, pinched nerves, and low back and neck pain to complex diseases such as muscular dystrophy and Lou Gehrig's disease. EMG Laboratory has provided advanced testing of nerves and muscles to communities in and around Merrimack Valley and Cape Cod since 1997. Drasko Simovic, M.D., Assistant Professor of Neurology at Tufts University is a graduate of the Boston University Residency Program in Neurology. He completed two sub-specialty fellowships at St. Elizabeth's Medical Center, Tufts University, in Boston, MA. He is Board Certified in Neurology, Electrodiagnostic Medicine, Clinical Neurophysiology and Disability Analysis. He is the Medical Director of EMG Laboratory, an AANEM Accredited Laboratory with Exemplary Status. His clinical and research achievements have been featured in national and international scientific and popular media. Dr. Simovic has also been honored by numerous Patient's Choice Award®, Most Compassionate Doctor Award®, and he was also features in BostonSuper Doctors®. Serving communities in and around Merrimack Valley, MA and Hyannis, MA for many years, EMG Laboratory provides the highest levels of patient care and diagnostic support for referring physicians in its state-of-the-art facility. EMG Laboratory, a multi-lingual environment, specializes in sophisticated Electromyography and nerve conduction testing that provides information about a range of nerves and muscles disorders. The highly detailed information and meticulous analysis that follows are critical to understanding the complete neuromuscular condition, which assists physicians in selecting an effective treatment plan. Visit www.emglaboratory.com for information about EMG Laboratory and Dr. Simovic. Dr. Drasko Simovic of Lawrence and Hyannis, MA is ranked among the top physicians in the nation based on patient reviews. 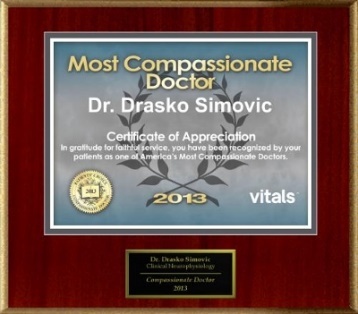 LAWRENCE and HYANNIS, Mass., March 6, 2014 /PRNewswire-USNewswire/ -- Vitals is pleased to announce that Dr. Drasko Simovic has been honored with the prestigious 2013 Compassionate Doctor Award. The accolade, which recognizes physician excellence, is given only to doctors who receive outstanding patient reviews throughout the calendar year. 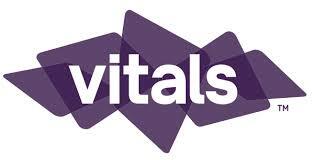 Of the nation's 870,000 active physicians, only 3 percent were accorded the Vitals Compassionate Doctor Award in 2013. To learn more about the doctor and see the award, please visit Dr. Drasko Simovic's profile on Vitals.com. Following the announcement of Dr. Drasko Simovic's selection for the Vitals Compassionate Doctor Award, American Registry added Dr. Simovic to The Registry™ of Business Excellence. An exclusive recognition plaque has been designed to commemorate the honor. The doctor's custom wall plaque is shown here. About Drasko Simovic: a short profile by and about the honoree: Dr. Simovic has completed his neurology residency at Boston University, followed by two fellowships in Electrodiagnostic Medicine and Clinical Neurophysiology at St. Elizabeth's Medical Center in Boston, Tufts University School of Medicine. He is Board Certified in Neurology, Clinical Neurophysiology, Electrodiagnostic Medicine and Disability Analysis. His clinical and research achievements have been published in national and international scientific and popular media. Dr. Simovic is the Medical Director of EMG Laboratory, an AANEM Accredited Laboratory with Exemplary Status. Dr. Drasko Simovic, medical director of the EMG Laboratory, was selected by his peers as an outstanding doctor in Boston area. After an extensive nomination and research process conducted by Key Professional Media, Inc., the results were published in Boston Super Doctors, a special section in the September 2013 issue of The New York Times Magazine. HYANNIS, Mass. and LAWRENCE, Mass., Sept. 30, 2013 /PRNewswire-iReach/ -- Dr. Drasko Simovic, medical director of the EMG Laboratory, was selected by his peers as an outstanding doctor in Boston area. After an extensive nomination and research process conducted by Key Professional Media, Inc., the results were published in Boston Super Doctors®, a special section in the September 2013 issue of The New York Times Magazine®. Each year Key Professional Media invites doctors to nominate colleagues they know to be exceptional in their specified field. Physicians are asked to consider the following question: "If you needed medical care in one of the following specialties, which doctor would you choose?" The research staff also contributes to the pool of candidates by searching medical databases, online sources, and publications for doctors who have attained certain credentials, honors or professional achievements. Candidates are evaluated on many indicators of peer recognition and professional achievement. Years of experience, hospital appointments, fellowships, leadership positions, academic achievements/positions, board certifications, publications, honors and awards and other outstanding achievement are all taken into account. This is followed by a "Blue Ribbon" panel review, and a final selection scrutiny that leads to only the highest-scoring doctors to be included on the Super Doctors list. "I am very grateful that my colleagues have nominated me and that they have confidence in our services. Our focus is to provide the highest level of Electrodiagnostic Medicine, assisting our referring physicians in establishing accurate diagnosis by performing an EMG test, which in turn allows for a selection of the best course of treatment for their patients," said Dr. Simovic. "It is a great professional achievement for me to earn my colleagues' trust, and I am honored that they feel comfortable in my diagnostic abilities even if they personally needed neurodiagnostic testing". Dr. Simovic has completed his neurology residency at Boston University, followed by two fellowships in Electrodiagnostic Medicine and Clinical Neurophysiology at St. Elizabeth's Medical Center in Boston, Tufts University School of Medicine. He is Board Certified in Neurology, Clinical Neurophysiology, Electrodiagnostic Medicine and Disability Analysis. His clinical and research achievements have been published in national and international scientific and popular media. Dr. Simovic has also been honored by numerous Patient's Choice Awards®. The American Association of Neuromuscular & Electrodiagnostic Medicine (www.aanem.org) is dedicated to advancing neuromuscular, musculoskeletal, and electrodiagnostic medicine. Its 5,000 physician members work to improve the care of patients with muscle and nerve disorders. Serving communities in and around Merrimack Valley, MA and Cape Cod, MA for many years, EMG Laboratory provides the highest levels of patient care and diagnostic support for referring physicians. EMG Laboratory, a multi-lingual environment, specializes in sophisticated Electromyography and nerve conduction testing that provides information about a range of nerves and muscles disorders. The highly detailed information and meticulous analysis that follows are critical to understanding the complete neuromuscular condition, which assists physicians in selecting an effective treatment plan. Visit www.emglaboratory.com for information about EMG Laboratory and Dr. Simovic. HYANNIS and LAWRENCE, Mass., Aug. 3, 2011 /PRNewswire/ -- EMG Laboratory, a state-of-the-art facility for electrodiagnostic medicine, was awarded the American Association of Neuromuscular & Electrodiagnostic Medicine's (AANEM) highest level of recognition, Accreditation with Exemplary Status. EMG Laboratory has provided advanced testing of nerves and muscles to communities in and around Merrimack Valley and Cape Cod since 1997. Currently, it is the first and only electrodiagnostic laboratory with such accreditation to serve these communities. Led by Drasko Simovic, M.D., EMG Laboratory is one of only 17 EMG laboratories nationwide to achieve the AANEM's peer-reviewed accreditation for high-quality performance, integrity and patient care, exceeding a rigorous set of measures of excellence. "This accreditation validates the quality of Dr. Simovic's work as superior," said Allan H. Ropper, M.D., M.D., Executive Vice Chairman, Department of Neurology, Brigham and Woman's Hospital, Harvard Medical School. "He's a dedicated and highly qualified specialist with a strong commitment to electrophysiology and to the patients he treats. He's thoughtful about how he conducts studies, tailors the study logically, and provides referring physicians diagnoses with certainty. Such certainty is important. It helps referring physicians make well-informed decisions about a clear course of patient treatment." Dr. Simovic uses techniques from major U.S. academic centers. He completed Boston University's Affiliated Hospitals Residency Program in Neurology and two fellowships in electrodiagnostic medicine and clinical neurophysiology at St. Elizabeth's Medical Center, Tufts University School of Medicine in Boston, MA. He is one of the few Boston-area specialists Board Certified in four specialties: Neurology (ABPN), Electrodiagnostic Medicine (ABEM), Clinical Neurophysiology (ABPN-CN), and Disability Analysis (ABDA). An Assistant Professor of Neurology at Tufts University's School of Medicine, Dr. Simovic has co-authored ground-breaking research in gene therapy and diabetic neuropathy and published research in novel electrodiagnostic techniques. "We are pleased to receive this accreditation and recognition from the AANEM," said Dr. Simovic. "Electrodiagnostic medicine is my passion. I receive gratification in my daily work by helping patients along the path of wellness and establishing correct diagnoses. Once we know the name of our 'medical enemy,' it's much easier for physicians to use the appropriate therapeutic tools. My dedication to providing test results to referring physicians on the same day the test is conducted helps doctors provide the best care to their patients." Electrodiagnostic medicine helps diagnose conditions with symptoms including pain, numbness, tingling and/or weakness from problems such as carpal tunnel syndrome, neuropathy, pinched nerves, and low back and neck pain to complex diseases such as muscular dystrophy and Lou Gehrig's Disease. Patients' Choice has announced that Dr. Drasko Simovic was one of a select few physicians honored with the prestigious 2011 Compassionate Doctor Certification. LAWRENCE and HYANNIS, Mass., April 4, 2012 /PRNewswire-USNewswire/ -- Patients' Choice has announced that Dr. Drasko Simovic was one of a select few physicians honored with the prestigious 2011 Compassionate Doctor Certification. Each year, nearly 100 million patients across the U.S. access websites like Vitals (www.vitals.com), UCompareHealthCare (www.ucomparehealthcare.com) , and Patients' Choice (www.patientschoice.org) to provide feedback about experiences with their physicians. Only those physicians with near perfect overall and bedside manner scores, as voted by their patients, are selected for the Compassionate Doctor recognition. Of the nation's 720,000 active physicians, only 3% were accorded this honor in 2011. Dr. Drasko Simovic commented on the recognition: "This is quite an honor for me. I am very pleased to have been selected and grateful to my patients who went out of their way to rate me and give me positive reviews." For more information on this Compassionate Doctor, please visit Dr. Drasko Simovic's profile on PatientsChoice.org. Following the publication of Dr. Drasko Simovic's selection as a Compassionate Doctor, American Registry seconded the honor and added Dr. Simovic to The Registry™ of Business Excellence. An exclusive recognition plaque has been designed to commemorate the honor. The doctor's custom wall plaque is shown here. For more information on Dr. Drasko Simovic, located in Lawrence and Hyannis, MA please call 978-687-2586, or visit www.emglaboratory.com. This press release was written by American Registry, LLC with approval by and/or contributions from Dr. Simovic and was distributed by PR Newswire, a subsidiary of UBM plc. Patients' Choice provides in depth information on doctors in your area who have been recognized and awarded for outstanding patient care and expertise. The Compassionate Doctor certification is the honor role of physicians who have received the highest overall and bedside manner ratings by their patients. American Registry, LLC, recognizes excellence in top businesses and professionals. The Registry™ includes over 2 million significant business and professional recognitions. For more information, search The Registry at www.americanregistry.com. Most people have heard of carpal tunnel syndrome, but not everyone knows when they have a condition in which the median nerve in the wrist is compressed by the overused, swollen tendons and wrist ligaments. The compression causes pain, numbness and tingling in the hand. An electromyogram, which measures the signals that run between nerves and muscles and the electrical activity inside muscles, is used when doctors suspect ALS. A final diagnosis is the result of the tests, the patient's medical history, and physician's examination, according to Dr. Simovic…Scientists still do not know what causes ALS, but there are some suspects, said Dr. Simovic. "Most likely the disease is caused by genetic susceptibility combined with, for now, unknown environmental factors." Only one drug, riluzole, has been found to be somewhat effective against the disease, said Dr. Simovic. It may increase survival by three months, but has no effect on strength, respiration or quality of life, he said…The process of finding a cure "will be a length tedious one," said Dr. Simovic. "But, many investigative efforts are being made all around the world." Doctors who were trying to grow new blood vessels with gene therapy found a welcome side effect: The therapy repaired what they thought was permanent nerve damage. The patients had poor circulation in their legs, several due to diabetes. Without treatment, they faced possible amputation. They already had ischemia, or a serious lack of blood flow to their legs. When the lack of blood is severe, nerves can be permanently damaged. At least doctors thought it was permanent. The doctors injected the patients with a gene therapy called vascular endothelial growth factor (VEGF) to attempt to grow back some of the damaged blood vessels. The Boston Globe reported that one of the patients, who the doctors called "very observant," noticed that the numbness in his leg had decreased considerably. Drasko Simovic, David H. Weinberg: Carpal tunnel syndrome. Arch Neurol/vol 57, May 2000, p:754-755. Hội chứng ống cổ tay (Carpal Tunnel Syndrome – CTS) là bệnh tổn thương một dây thần kinh hay gặp nhất trên lâm sàng. Mặc dù ngày nay bệnh được biết đầy đủ, nhưng cũng phải mất gần 100 năm từ những đánh giá ban đầu cho tới khi sinh lý bệnh học của bệnh được chấp nhận là do chèn ép dây thần kinh giữa ở cổ tay. Mô tả ban đầu..
Studies of the use of gene therapy for revascularization in peripheral vascular disease patients were described at AHA by Dr. Drasko Simovic of St. Elizabeth’s Medical Center (Boston, Massachusetts). Simovic’s studies involved the intramuscular injection of a gene encoding for VEGF in patients suffering from peripheral neuropathy of the leg. Doctors trying to grow new blood vessels in the legs of patients with poor circulation yesterday reported an unexpected result: In 10 of 19 patients, the gene therapy treatment appeared to repair nerve damage that is usually considered irreversible. Researchers at St. Elizabeth's Medical Center in Brighton, led by Dr. Drasko Simovic, assistant professor of neurology at Tufts University School of Medicine, cautioned that the results are preliminary, since the study had no control group and some results could be attributable to a placebo effect..
Gene therapy with a blood vessel growth factor appears to improve the painful nerve damage that sometimes occurs when artery disease reduces blood supply to the legs, Massachusetts researchers report.